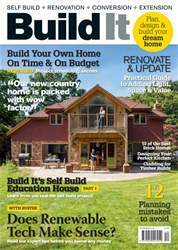 Digital Subscriptions > Build It > December 2018 > What is a soil survey? There are a range of surveys available to determine the conditions on your building plot and whether there’s any risk in constructing a house there. You can have a professional inspect any existing structures, tree and plant growth, contours of the land, provision of services, neighbour issues, access and overhead cables – but the only solution that will tell you what’s in the ground itself is a soil survey. It’s by no means essential to have this investigation – in fact, most self builders choose not to – but doing so will help you to accurately budget for your project’s groundworks. There are various approaches to this analysis, all providing a really good indication of what type of soil strata exists on your site. The findings will let you know if any specialist foundation work is needed. So, if you have the tests done before exchanging on the sale, then any bad news from the result will off er you an opportunity to renegotiate the cost of the site with the vendor or even not proceed with the purchase.